It is our goal to increase the exchange of knowledge among engineers of our portal PARTcommunity. As a benefit for our active community members we have created several challenges together with the support of numerous component manufacturers, which are awarded with interesting prizes. Follow the description and tasks of the respective engineering challenge. Post your contribution together with a photo or screenshot to the defined section within the PARTcommunity portal. After the process is finished an independent jury will figure out the winner and notify him. We'd be more than happy to answer any questions you have per email under Marketing@cadenas.de or via telephone under +49 (0)821 2 58 58 0 - 0. Want to start a challenge yourself? You are a component manufacturer and want to create your own competition? Contact us under Marketing@cadenas.de or per telephone under +49 (0)821 2 58 58 0 - 0. CADENAS is celebrating its 25th anniversary! 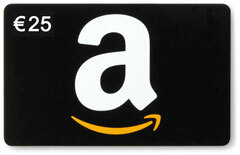 Every week Amazon gift vouchers worth 25 EUR are waiting for you. Every week there is a new challenge to be conquered. Show us and the entire PARTcloud.net Community your funny, creative, unusual or useful ideas for the current topic. Join the group to stay up to date and Get the latest info about the challenges. What is there to win? The weekly winners get an Amazon.de gift voucher worth 25 EUR! Every contribution that is posted until sunday 12 p.m is part of the evaluation.The winner of the weekly challenge is elected on the following Monday.. The winner will be contacted by email through the address they entered into their PARTcommunity account. Those who cannot be reached by the provided email will forfeit their win. The PARTcloud.net weekly Challenge 2017 runs from 01.01.2017 - 31.12.2017. Tip: check the group regulary to get updates about the latest tasks. Who is allowed to take part? Eligible participants are those who are a PARTcommuinity user. By uploading, you are agreeing to our conditions of participation. We wish you lots of luck! Winners will be announced weekly.